A simulation image shows a Type Ia supernova (in brown). The explosion ejects material at a velocity of approximately 10,000 kilometers per second (6,200 miles per second), slamming into its companion star (light blue). The collision produces an ultraviolet pulse. Debris blown off a dying star collided with its companion, creating a blast of ultraviolet radiation that is helping scientists to better understand the evolution of one of the key tools to measure the expansion of the universe. Known as Type Ia supernovas, these rare events have led scientists to argue for two different theories, but new observations of a recent supernova by NASA's space-based Swift telescope suggest that both may be correct. "This pulse of radiation is strong evidence for the existence of a companion star in a Type Ia supernova," Cao said. Type Ia supernovas play key roles in helping scientists measure the expansion of the universe, but how these objects formed has remained a subject of debate for many years. Both of the two hypotheses regarding their origin start with a white dwarf, the dying remnant of a star, in orbit with a companion. The interaction between the two results in the signature explosion. The companion to the exploding white dwarf is the key element of both ideas. Under the double-degenerate model, the companion is a white dwarf. When the two white dwarfs merge, a Type Ia supernova occurs. In the single-degenerate model, the companion remains a full-fledged star. Gravity pulls material from the star onto the white dwarf until it triggers a nuclear reaction that results in the explosive death of the white dwarf. In May 2014, a robotic observing system known as the intermediate Palomar Transient Factory (iPTF) observed a supernova in galaxy IC 831, which lies 300 million light-years away from Earth. European and Israeli collaborators on the project alerted their American counterparts, including Cao, who quickly turned both ground- and space-based telescopes toward the new explosion, known as iPTF14atg. One of the instruments, NASA's Swift telescope, detected the ultraviolet pulse that marked the explosion as having a fully evolved star as a companion, rather than a white dwarf, supporting the single-degenerate model. This burst was modeled in 2010 by Daniel Kasen, an associate professor of astronomy and physics at the University of California, Berkeley, who holds a join appointment at the Lawrence Berkeley National Laboratory. According to Cao, Swift's responsiveness and capacity for flexible scheduling were key to determining the origins of the explosion. "If we had looked at iPTF14atg one or two days later, we would not have been able to detect the pulse of radiation," he said. The results were published online today (May 20) in the journal Nature. While a Type Ia supernova can flash bright enough to outshine its host galaxy, the white dwarf that sets the supernova off is extremely difficult to observe. When a regular star explodes in a supernova, scientists can look back at existing images of the part of the sky where the object is located in an attempt to identify the parent star. This is not the case with white dwarfs, which are extremely faint. A white dwarf forms when a star runs out of sufficient hydrogen to power fusion at its core. The only light given off by the star is what remained once the fusion process ended. As a result, white dwarfs are dim and growing dimmer by the day, making them extremely difficult to detect. When combined with the infrequent occurrence of the required explosions, it makes searching for the progenitor almost impossible with current instruments. 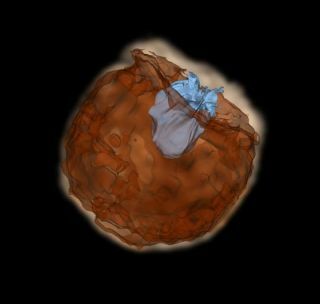 "Because Type Ia supernovae are rare, we have not found any supernova close enough for us to identify its exploding star in the pre-supernova images," Cao said. "This supernova would have to be very close — for example, inside our own galaxy." Scientists refer to Type Ia supernova as 'standard candles' because their brightness is consistent throughout the universe. This is the case because the nuclear chain reaction that kicks off a Type Ia supernova must occur in the same way, when the white dwarf reaches a very specific mass. By comparing the known brightness of an object to its distance, scientists can determine how far away the object lies. The process is similar to determining that a 60-watt light bulb is a mile from the observer because it is 100 times dimmer than another 60-watt bulb a tenth of a mile away. The consistent explosions have played a key role in measuring the expansion of the universe, even though their origins have remained hotly debated. Although the observations of iPTF14atg suggest a single-degenerate model, other recent studies have shown evidence for explosions birthed under the double-degenerate model. This means that the precursors to some Type Ia supernova may host companion stars, while others pair up with white dwarfs, a fact with the potential to affect scientists' understanding of these candles. "Probably supernovae from different origins behave in different ways," Cao said. "Understanding Type Ia supernovae from different origins and developing methods to subdivide them into different subclasses are currently under investigation by many research groups."